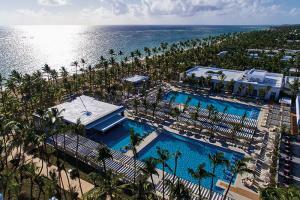 This friendly, fun hotel features 1000 bungalow-style guestrooms on one of Punta Cana's most beautiful beaches. The resort offers 24-hour all-inclusive (snacks and beverage) service, exciting activities, nightly outdoor entertainment, and a nightclub and casino surrounded by inviting swimming pools and tropical vegetation. The resort also features an Asian restaurant and a 24-hour sports bar. Guests enjoy “stay at one, play at two” privileges with the sister hotel Riu Naiboa. Clients staying within the RIU complex have free unlimited access to the New Splash Water World. Located on the pristine white sand Arena Gorda Beach amid lush tropical gardens and palm groves, 19 miles from the International Airport. Colonial - Main restaurant; Mama Juana - Mexican restaurant; San Angelo - Italian restaurant; Hibachi - Asian restaurant; Palm Beach - Steakhouse; Kulinarium - Specialty restaurant; Olé - Spanish restaurant.